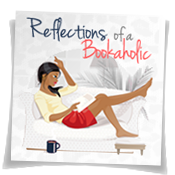 Reflections of a Bookaholic: Why I Love Wednesdays...Discussion Topics Needed...Help! Why I Love Wednesdays...Discussion Topics Needed...Help! 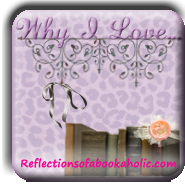 Why I Love Wednesdays is a weekly meme where I get to gush about my favorites within a given topic. I mentioned previously that I was considering discontinuing the feature. However, after much reflection, I realized that I just can't let it go. I really love talking about the things that I love and sharing with everyone when I find new loves. If this sounds like something you are interested in, please feel free to join in every Wednesday. I usually post very early in the day and it includes a linky so that everyone can hop and see everyone's posts. Feel free to tak e a look at some of my previous posts. You can find them here. Oh and don't forget I'm giving away Mockingjay because someone gave it to me. You can click here to read about that and enter the giveaway. Also, don't forget I'm answering questions as part of my Blogoversary reflections. If you have any for me. You can fill them out in the form here. Oh these are some good ones. I don't have most of them but I do now. Thanks! I totally understand how life can be. If you can participate I'd love to have you, if you can't I inderstand. I never got the hang of twitter. I don't know why. I will try to be more active on there this year. It appears to be the place to be. Thanks Jade! I'm adding those as well. oOOh these are awesome. Loves it! And they are all great and different. I can't believe how many topics we haven't done before. That's a good one. So many people are doing challenges. It would really work. Thanks! I've submitted a help request from the guys at Disqus. If they can't fix it, I'll be returning to blogger comments. The prospect isn't so bad anymore because it is really easy to comment on blogger blogs on my iPad. Oooh Cute! I wrote it down. I can't believe I've never had a book covers Why I Love Wednesday. Oh that would be fun. This is why I need you gals because these ideas are so much better than I could come up with on my own. Thanks for your help Tanya, I'm getting them all down. 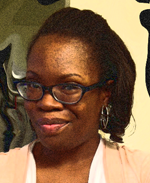 So what are author twitter streams? I'm missing out it seems. Wow these are awesome and most of them we haven't done before. Thanks bunches! Wow! There are some great ideas here. I love book jewelry! What about books from (insert country). How about : favorite title; animal hero; foreign book (translated); non-fiction; that's all I got right now. Alexis, Disqus and I are still not getting along. I can only post from my iPad. One of these days I plan to do a post on arranged marriages in books. Would love to see your take on it. Book inspired jewelry, clothing, etc. You should try Dorothy West. She was Harlem Renaissance and her book The Wedding was awesome. I also enjoyed The Living is Easy by her. Good luck with your paper. Harlem Renaissance (I have to do a paper on this and I want to know what people know about this era - selfish, I know). I never imagined we could generate this many topics. I'm excited. I'm adding yours to the list as well. I've been wanting to participate in your meme for the longest time, but my book blogging has been so sporadic lately that I felt I wouldn't give the feature enough attention. Now that my job is changing (I'm not going to have one for the time being...unless you could full-time writing lol) I have more time on my hands! I think Favorite Comfort Read or Guilty Pleasure Read are both good ideas! Fave food and location is interesting, too! Maybe Fave Side Character? Have you done that? Fave genre you've always wanted to read but haven't tried? I have to think of some more. Oh I meant authors that tweet regularly and interesting. I'm sure there are a few but alas, I don't use twitter much anymore. Oh and favorite comfort read or guilty pleasure read. Oh this sounds actually like a really cool meme. I might have to join in! I always love going on and on about bookish things. lol ;) Lots of great ideas too! Lol. That was a funny week. I was in some kind of mood when I wrote that post and the responses were very...interesting. Thanks! I'll be sure to have another post like it. Book jewelry is a fabulous idea! I am so glad for all the help. Oh love both of these and we haven't written about them. Ooh I can't wait! Goodluck on your paper. I took a class on the Harlem Renaissance but nothing is coming to mind. What do you want to know exactly? oh gosh! i can't think of anything off the top of my head, but i really liked your edward as a villian post and the discussion that followed!! okie doke, you got some great ones here so i'll just mosey on by. lol. oh, why I love ...book challenges, name one of their favorite challenge. How about favorite stand alone novel? How about why I love (loathe) villains? Did you do that yet? 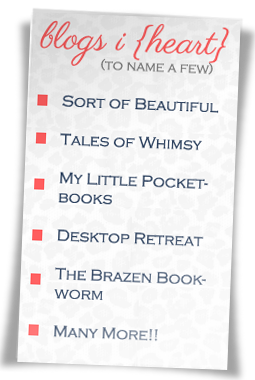 Oh I love Tanya’s ideas about bookish sites! Meet cute scenes (you know, when in books and movies the hero/heroine meet under crazy and unbelievable circumstances, like when the heroine runs over the hero’s dog). You could make one about food, like books with characters that are chefs or take place in restaurants.